to disease and winter damage. Optimum growth and nut production will be achieved by using a proper combination of fertilization, proper spraying, pruning and irrigation. 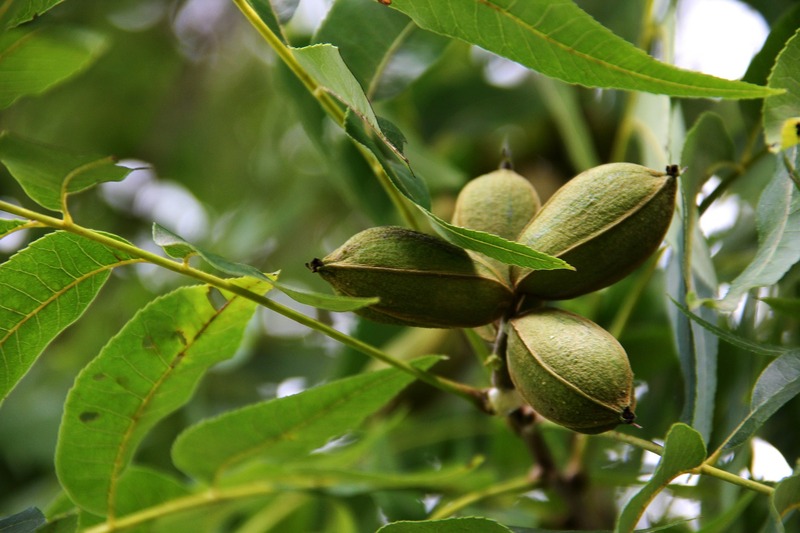 In the spring and early summer, a properly fertilized pecan tree will have an abundance of large, dark green, healthy leaves forming a full canopy. Whether this healthy canopy continues until late fall depends on the level of insect and disease infestations, the variety and tree location. Annual terminal growth on a mature bearing tree should be 8-12 inches long. A young, non-bearing tree normally produces more growth. The fertility needs of pecan trees can vary. Young pecan trees transplanted in deep, loamy, fertile soil may not need fertilizer additions immediately. But trees transplanted in non-fertile, poorer soils may require several split applications of fertilizer beginning in June the year of transplanting. Apply the fertilizer under the tree one foot from the trunk to slightly beyond the tips of the branches. Usually the spread of the pecan tree root system eventually reaches 1-1/2 to 2 times that of the branches. Exercise care when using this method, because excess fertilizer could injure lawn grasses. Fertilizer should be applied by broadcasting over the root zone of the pecan tree. Fertilizing trees by placing fertilizer in holes beneath the trees gives little additional benefit. Trees should be fertilized during the late dormant season, usually February or early March. If fertilizer is applied during an extended dry period, it is best to water the area thoroughly with a sprinkler, applying 1 to 2 inches of water. Based on trunk diameter - Apply 3 lbs. of a complete fertilizer (8-8-8) or an equivalent amount of another complete fertilizer per inch of trunk diameter measured at about one foot above the soil line. Later during the growing season (May or June), add an additional 1/2 lb. of ammonium nitrate per inch of trunk diameter on trees 25 years old or older. When zinc deficiencies occur on acid soils, apply 36% zinc sulfate to the soil at a rate of 1/2 lb. per inch of trunk diameter up to a maximum of 10 lbs. per mature tree every third year. On alkaline soil with a pH of 7.0 and up, zinc must be sprayed on the leaves at 14-day intervals beginning in April through June. Use 2 to 3 lbs. per 100 gallons of water or 2-3 teaspoons per gallon of water. Three sprays should be sufficient on older trees, three to five on younger trees. For small acreages, use 400 lbs. ammonium nitrate per acre on trees 40 years old or older, 300 lbs. on trees 25 to 40 years old and 200 lbs. on trees 15 to 25 years old. This application can be applied in March, but it is often split with half being applied in May. The split application is most important if water stands around the trees for a couple of weeks in the spring. The use of a balanced fertilizer (13-13-13) or (8-8-8) as the main nitrogen source can correct phosphorous and potassium deficiencies indicated by soil test. Annual fertilization is the most practical and effective tool available to the homeowner for improving pecan production. But, fertilizers cannot compensate for poor conditions such as lack of moisture, inadequate disease or insect control, undesirable soil and sites or poor varieties.